With the success of the App Store within iTunes for iPhone, iPad and iPod touch, Apple decided to give Mac users the same experience for their computers with the release of the Mac App Store. Like the iTunes App Store, the Mac App Store can be browsed by Categories, Featured, or Top Charts. 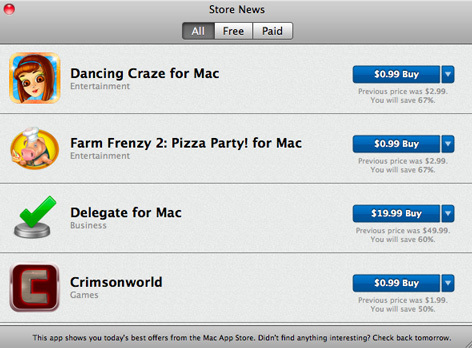 But there’s nothing within the Mac App Store interface that shows which apps are on sale, or have lowered their price. That’s where Store News comes in. Store News does one thing, but does it very well: everyday it checks all the apps listed in the Mac App Store. If a price drops, or is made free, it will appear on the Store News list, which can be sorted by Free, Paid, or All. Store News is a much easier way to find out what’s on sale on any given day; however, there’s no way of checking what was on sale yesterday or a few days ago. Store News just reports what’s on sale today. It would be nice if the developer could add in a way for users to check previous days sales, even if only a few days back. Overall, Store News is a great way to stay on top of changing prices. Besides, the app is free: how can you go wrong?